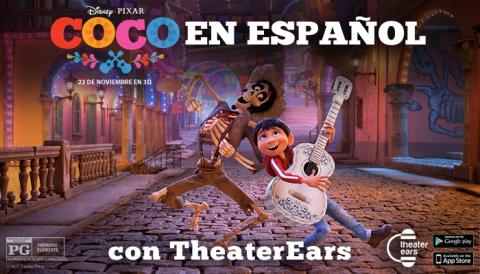 BURBANK, Calif. — (BUSINESS WIRE) — November 22, 2017 — TheaterEars announces a new collaboration with The Walt Disney Studios for its smartphone app that enables moviegoers to listen to the Spanish language version of Disney/Pixar’s “Coco” using their own earbuds or headphones while watching the English language version on the big screen. Available at most theatres in the United States, the app allows moviegoers to select a showtime at a theatre and download the Spanish audio track before leaving home. The app works by using your smartphone’s microphone to sync to the movie playing on the big screen. “We are very excited to be working with Disney to bring more accessibility to Spanish-speaking audiences. The response that we’ve seen from audiences in our testing is that US Spanish-speakers want to experience the movies in their language. We want to make that dream a reality,” said Dan Mangru, CEO of TheaterEars. “We are delighted to enable Spanish-speaking viewers to share the emotion, laughter and excitement of “Coco” alongside English speaking family and friends,” says Paul Holliman, Vice President of Sales at Walt Disney Studios. TheaterEars is available on both the App Store (iOS) and Google Play (Android) and at TheaterEars.com/Download. The app supports moviegoers throughout the United States and Puerto Rico. Initially, the app will support movies in the United States in Spanish, with future plans to expand internationally and add more languages. For more information about TheaterEars, visit TheaterEars.com and follow TheaterEars on Facebook, Twitter, and Instagram. Despite his family’s baffling generations-old ban on music, Miguel (voice of Anthony Gonzalez) dreams of becoming an accomplished musician like his idol, Ernesto de la Cruz (voice of Benjamin Bratt). Desperate to prove his talent, Miguel finds himself in the stunning and colorful Land of the Dead following a mysterious chain of events. Along the way, he meets charming trickster Héctor (voice of Gael García Bernal), and together, they set off on an extraordinary journey to unlock the real story behind Miguel's family history. Directed by Lee Unkrich (“Toy Story 3”), co-directed by Adrian Molina (story artist “Monsters University”) and produced by Darla K. Anderson (“Toy Story 3”), Disney•Pixar’s “Coco” opens in U.S. theaters on Nov. 22, 2017. For more information, check out http://movies.disney.com/coco, Hashtag: #PixarCoco, Pixar Coco Facebook, Pixar Coco Twitter and Pixar Coco Instagram. TheaterEars is an iOS and Android based app that enables moviegoers to experience a movie in Spanish at the movie theater in real time using their smartphone and earbuds. The company was founded in February 2013 by Larry (an orthodontist) and Virginia Kawa, a husband and wife from Boca Raton, FL, in order to help Virginia’s mother (a Spanish-only speaker) experience the movies with the entire family.